Properties in Cable Bay average 4.7 out of 5 stars. Property 1: Perfect for a luxury retreat, a unique coastal escape, or memorable honeymoon. Coastal Escape - Modern Nelson Getaway! Property 4: Coastal Escape - Modern Nelson Getaway! 'BeachViews' - Stunning Waterfront Home! Property 17: 'BeachViews' - Stunning Waterfront Home! 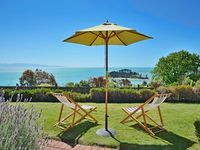 Exceptional Views over Tasman Bay Tahuna Beach! 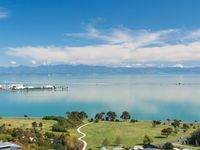 Property 19: Exceptional Views over Tasman Bay Tahuna Beach! The Perfect Treat for two on Nelson's Waterfront! Property 20: The Perfect Treat for two on Nelson's Waterfront! Stunning sea views and panorama of Abel Tasman Bay with awesome Sun Sets. Property 25: Stunning sea views and panorama of Abel Tasman Bay with awesome Sun Sets. Riverside Villa - Nelson City Centre on the River! Property 37: Riverside Villa - Nelson City Centre on the River! Rural Nelson Bliss in the city. Property 45: Rural Nelson Bliss in the city. Pleasant accomodation with great views. Everyone has different interpretation of what luxury is, for us, more thought could be put into the guests experience and improving overall quality of such as, the master bed. Stunning views of Nelson Bay and Abel Tasman National Park to the north. Several gorgeous sunsets and sunrises during our 2-week stay. Very comfortable living in the house. Vaulted ceilings make it feel even bigger than it is. All the amenities are included. Easy access to Nelson shopping. Drive up to house is a bit steep and driveway is a little awkward, but we didn't notice after a few days. You get great exercise walking pathways in neighborhood.